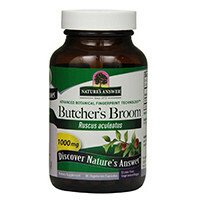 What is Butcher’s Broom (Ruscus Aculeatus)? 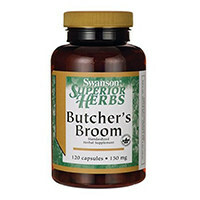 This is our list of the best selling butcher’s broom supplements on the market right now. 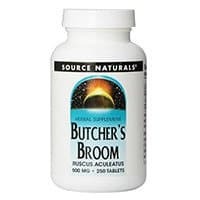 These 10 butcher’s broom brands have been ranked because they dominate the e-commerce sales charts, fitness bloggers love them and they have the highest user reviews online. This supplement comes in 470mg pills. Customers should take 2 capsules daily. Non-GMO, vegan, and gluten free. 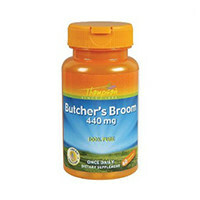 The pills contain pure, dried Butcher’s Broom root. Other, inactive ingredients include vegetarian gelatin, cellulose, and magnesium stereate. This product is sold in 1000mg-strength capsules. Two capsules should be taken 3 times a day, preferably with food and water. Single herb supplement. It is organic and non-GMO. 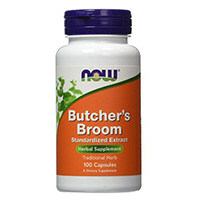 The formulation of this supplement is holistically balanced and vegetarian. Source Naturals tests and verifies their supplements for potency using an Advanced Botanical Fingerprinting Technology. Additional ingredients include vegetable cellulose, rice flour, and calcium silicate. 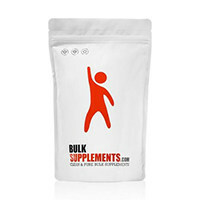 This supplement comes in 500mg tablets. Customers should take 1 tablet daily with a meal. Free of the following: dairy, yeast, soy, eggs, gluten, corn, soy, wheat, starch, salt, and artificial ingredients. The capsules also contain calcium. Other ingredients include dibasic calcium phosphate, sorbitol, stearic acid, cellulose gum, microcrystalline cellulose, and magnesium stereate. This supplement comes in 100mg tablets; 2 tablets should be taken 2-3 times a day. The pills are free of soy, nuts, eggs, dairy, and gluten. Non-GMO, vegan- and vegetarian-friendly, and are made according to Good Manufacturing Practices (GMPs). Other, inactive ingredients include rice flour, gelatin, magnesium stearate, and silica. Patients should take 1/6 teaspoon of powder for the equivalent of 500mg. It should be taken 3 times a day. The powder comes in a concentration of 10:1. Free of allergens, including sugar, soy, dairy, yeast, gluten, corn, and any artificial additives. Customers should lower their dose if they experience any stomach upset. There are no other ingredients in this powder. This supplement is sold in 470mg doses; customers should take 1 capsule daily with water. 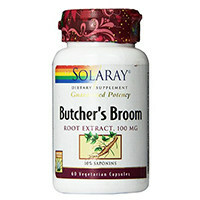 The product is made from pure, powdered Butcher’s Broom root. Customers should consult with a doctor or other medical professional if they are already on medications or other supplements. Other ingredients include gelatin, microcrystalline cellulose, magnesium stearate, and silica. 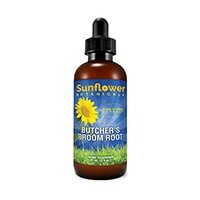 The recommended dose for this extract is 2 droppers’ full (1.6ml). The supplement comes in liquid form for maximum absorption. The extract is derived from either organic or wild-crafted herbs. The supplement is made in the U.S.A. following Good Manufacturing Practices. The products also contains water and is 30-40% alcohol. The Herbal Strength Ratio is 1:3:0. The strength of these tablets is 100mg. One to two tablets should be taken once or twice a day with water. 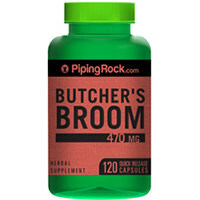 The pills are guaranteed to have 10% saponins, the active ingredient of Butcher’s Broom. This supplement is Green Screened so that it is free of pesticides, herbicides, and heavy metals. This product is a single herb supplement and is guaranteed to be non-GMO. Other ingredients include cellulose and gelatin. This product comes in 470mg tablets and should be taken twice daily. Piping Rock guarantees 10% ruscogenin per capsule. The pills are free of allergens and non-GMO. If stomach upset should occur, a customer should stop the supplement immediately and consult a physician. Other ingredients include gelatin, rice powder, and vegetarian magnesium stearate. Each capsule is 1500mg. Two capsules should be taken twice a day with meals. The product is made in the USA and is free of common allergens such as dairy, soy, gluten, and nuts. The product has been rigorously tested for consistency, quality, and the potency of its ingredients. The company cautions not to exceed the recommended daily dosage of their supplement. Other ingredients include gelatin and water. Butcher’s Broom is a low-growing evergreen shrub native to the Middle East, Mediterranean countries, and the Southern United States. According to Drugs.com, it has spiky, sharp leaves and very stiff stems; it gets its name from the fact that in the Middle Ages, those stems would be tied together in small brooms which butchers would use to scrub down their cutting boards. The herb was also used medicinally throughout Europe since ancient times, but it was not until the 1950s that it began to be studied scientifically. It grew popular in the 1970s when natural remedies began to be used widely once again. 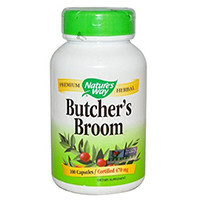 There is a small sample of scientific research on the medicinal use of Butcher’s Broom so far, and the Examine.com website cites several clinical studies which have investigated this herb. Unfortunately, not all supplements now on the market are of the same high quality. With the array of products available, it is no wonder some consumers feel hesitant about which particular supplement to buy. The good news is that there are some specific things to look for in order to be assured that the product is the best one possible. Dr. Julian Whittaker, a wellness expert, recommends that savvy shoppers look for a product that has been standardized. This means that its ingredients have been tested in a laboratory and the product is guaranteed to contain a certain amount of the active components. He also recommends that consumers do a little homework on the manufacturers and find out which ones have been certified by third parties by meeting certain quality standards. He also recommends buying supplements that come in dark or opaque bottles to preserve the sometimes delicate active constituents of the supplement. When considering how much Butcher’s Broom to take, customers should be aware that there is some debate on the subject of dosing. The Examine website notes that most of these supplements are available in concentrations ranging from 1:10 to 1:20. In this case, a dose of between 30mg and 37.5mg is recommended. However, the Drugs.com site recommends taking this supplement at a lower dosage, depending on the health conditions of the one taking it. For customers who have venous insufficiency, 7-11mg is adequate. Others who have problems with the health of their blood vessels can benefit from a higher dose, around 16mg. Because of this debate, it is especially important for customers to consult a physician before use.